Treat yourself to Rikli-style holistic relaxation at the Rikli Balance Hotel – thermal water and a rich offer of wellness programmes with an Alpine character! Did you know that we have thermal water at Bled? 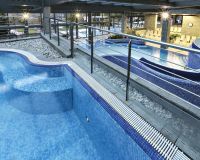 Try it at Živa Wellness, which has the largest swimming pool complex in the Gorenjska region! The sauna relaxes. If you combine it with a view of the magnificent Lake Bled, you will find yourself on cloud nine. Alpine wellness programmes, massages and baths give a special note to our services. The power of nature will invigorate your body and soul! Natural healer Arnold Rikli founded a healing centre in Bled in the 19th century. We still follow his holistic approach to well-being today. Treat all of your senses to complete wellness pampering! Natural healer, Arnold Rikli, who founded a healing centre in Bled in the 19th century wrote: "Our every thought, breath and heartbeat, our every feeling, conviction and movement sends energy signals through the body that influence our entire being." Adopting this thought, Živa Wellness offers a wide range of relaxing massages, baths, body and facial treatments, and saunas. The concept is complemented by the Alpine character of Bled, which is reflected in the use of spruce buds and Carniolan bee honey, which have multiple positive healing effects on the body and soul. The Wellness Živa swimming pools boast the most beautiful view of Bled that will recharge you with positive energy when coupled with soothing relaxation. Visit Živa Wellness which has been ranking among the top wellness centres in Slovenia for several years! Živa Wellness offers six swimming pools with a view of Lake Bled! Guests at our hotels get free or discounted tickets. Six different saunas with a view of Lake Bled and an accompanying offer of sauna programmes. A hot tub with a view is also available. A wide range of massages with additional seasonal special features. Including pain relief massages, anti-cellulite massages and – our specialty – the ...Alpine massage! Diverse one or several day programmes for romantics, relaxation seekers, athletes, teens, etc. 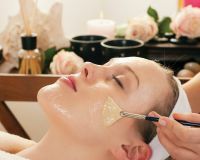 We offer beauty treatments of the face, hands and feet as well as depilation. Seasonal programmes for a shining complexion. Immerse yourself in a bath that will speak to all of your senses. The bath relaxes the muscles and lets you be alone with your thoughts.